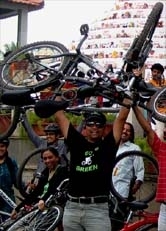 Feb-09 Critical Mass (28-Feb-2009) - GGI-Group size: 4000+ Professionals, Increasing on day to day basis, Come & join us 2 serve Mother Nature. 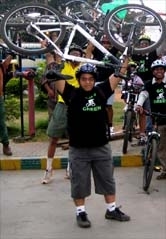 We, south B'lore cyclist decided to meet at Cafe coffe day/Reliance Apple shop J'nagar 5th block @ 3:30pm. 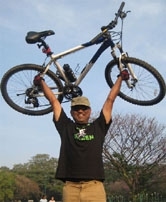 Root covered : Café Coffee day – Jaynagar 4th Block – Jaynagar 3rd block – Ashoka Pillar – Lalbagh rear gate – Lalbagh main gate – double road – levelle road – Jewels De Paragon – Cubbon Park Press club. Group photo session and were waiting for TV-9 persons for media coverage. Started CM @ 5:00pm, there were 60 cyclist out of which 5 lady cyclist and the root selected was as below. B’lore press club – Minsk Square – GPO – U turn infront of Vidhan Souda – Indian express bulding – Jewels De paragon – MG Road – Trinity Circle – Airport road – domulur flyover – Indra nagar 100 ft Road – CMH road junction.